It's the perfect time for a relaxing staycation or backyard social. A few updates to your lighting can enhance your outdoor enjoyment. OUTDOOR OASIS: Update your lighting for more enjoyable entertaining. Layer outdoor lighting. Just like indoor lighting, outdoor lighting is most effective if it utilizes overhead, task and ambient light sources. Even outdoors, where there are not typically boundaries and borders, those three layers will enhance enjoyment and help define smaller sitting and entertaining areas as though they are outdoor rooms. Create a safe and secure environment. Enhance security with lighting near entrances and in dark corners. Aim lights away from the door so as not to blind anyone as they enter your outdoor area. Reduce glare. Light walkways and paths with light that is cast downward and with fixtures that are hooded. In many cases, exterior-safe dimmers and moveable fixtures, which can be added to a patio or porch as needed, can provide flexible control over the level of light. Add decorative elements. While functionality is the top priority, aesthetic elements are important for a relaxing and inspiring setting. Focus on lighting that highlights architectural and natural details, as well as other decorative elements like arbors, pergolas, patios, etc. Conserve energy. Consider LEDs for their efficiency. Also think about Energy Star and Dark Sky fixtures that reduce glare and minimize light into the sky as well as neighboring yards and windows. Remember to check the color (chromaticity) of LED outdoor lights. Low chromaticity lights (2700 or 3000K) will look similar to incandescent and halogen bulbs. Higher chromaticity LEDs (4000K and above) will have a whiter, bluer look. 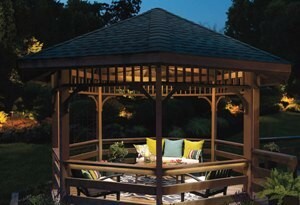 Visit a nearby ALA-member retail store to see the latest lighting to create your outdoor oasis. BRIGHT TIPS: Order a free copy of BH&G's Lighting magazine today. The 2016 issue of Lighting magazine has the latest lighting trends for every room in your home. Pick up a free copy at your local ALA-member store or by visiting the ALA website. Lightingis full of inspirational design ideas for your home. For example, drum shades, while not new, are now even better and more stylish. Many of this year's versions feature etched-out shapes, a mix of materials and distinctive textures. The result is a collection of transitional styles that works from entry to dining room, living room and beyond. Pick up a free copy of Lighting magazine at an ALA-member store. Request a complimentary copy ofLightingmagzine orview a digital version. Are old-fashioned incandescent light bulbs still available? Although it is commonly believed that incandescent light bulbs are no longer available, that is actually not the case. Several years ago, new guidelines directed manufacturers to produce more efficient incandescent bulbs. While those bulbs are no longer available in the traditional wattages of 100, 75, 60 and 40, they are now available in comparable light outputs of 72, 53, 43 and 28 watts. When you shop for these bulbs they will also say that they are "halogen incandescent." This means that they are incandescent bulbs, but they also use a halogen gas that makes them more efficient. The quality of the light of the new bulbs is very similar to that of the old bulbs, although they sometimes will appear "whiter." You also can purchase the older incandescent technology as "rough service" bulbs. These are the exact same type of incandescent as the original incandescent bulbs, but they are designed to be more durable than standard incandescents. To see the various types and options of bulbs available, please visit a local ALA-member lighting showroom.